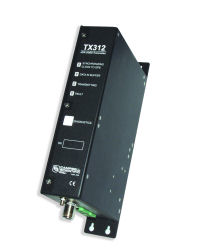 The TX312 is a satellite transmitter that uses the GOES satellite system to provide one-way communications from a data collection platform (DCP) to a receiving station. The TX312 complies with the High Data Rate (HDR) specifications and supports transmission rates of 100, 300, and 1200 bps. Note: Services and support are no longer available for the TX312. Output Power Complies with NESDIS DCPRS Certification Standards, Section 4. For 1200 bps, it has a nominal EIRP of 51 dBm and a maximum EIRP of 53 dBm, assuming appropriate antenna. For 100/300 bps, it has a nominal EIRP of 48 dBm and a maximum EIRP of 50 dBm, assuming appropriate antenna. The TX312 transmitter should be housed in an ENC16/18 environmental enclosure. Customers can order the 19332 and 19336 Antenna Cable/Bulkhead accessories to have Campbell Scientific punch a special bulkhead hole in the enclosure and install 17” cables for the Yagi and GPS antennas. Typical power supply is a BP12 12 Ahr or BP24 24 Ahr battery, CH100 regulator, and an SP10 or SP20 solar panel. A user-supplied deep-cycle rechargeable battery should be used when it is difficult to replace the batteries or the system's power requirements are large. The deep-cycle rechargeable battery should have at least a 60 Ahr capacity, and be trickle-charged with an 20 W solar panel.